Over the past few years I've realised that I'm quite the picky person when it comes to perfumes. On more than one occasion I've sniffed at a scent in store, liked it and bought it, only to hate it a few days later. Now though, if I think I like a fragrance, I'll go back into the shop on numerous occasions, spray it, and keep it for day or two. There are 3 in particular that I really, really like. Guerlain's La Petite Robe Noire is my favourite of the bunch, I honestly can't fault it. I received two 50ml bottles for my birthday back in November and I've already ploughed through one. With notes of black cherry and liquorice, it's sweet without going overboard and has almost a fizzy sort of scent. I will keep repurchasing it as long as it's available. I picked up Diptyque Philosykos in the Space NK sale just after Christmas. For half the original price, I just couldn't resist. It's a very earthy, fresh fragrance with a shot of fresh fig that dies down to a sweet coconut scent. I've been asked what I'm wearing on more than one occasion when I wear this, and it seems to be a firm favourite of many. My newest perfume is the Nina Ricci L'eau ETD. I was originally going to pick this up in duty free at the airport when I go to Florida as I wanted something that would remind me of the holiday, but Feel Unique had 20% off and I had to order it. It's a very fruity scent with notes of cherry, apple and grapefruit, however it's also quite light and fresh due to the inclusion of watery notes. I'm really inclined to try more Nina Ricci fragrances after buying this! 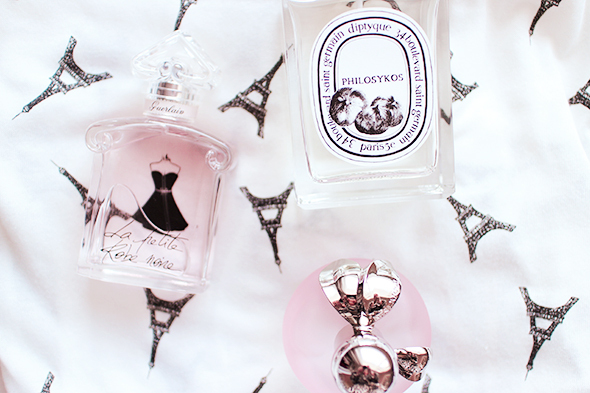 What are your perfume picks? I regret not buying Philosykos when I was at the diptyque flagship store in Paris last September. I opted for Ofrésia instead which is okay, but I think it's just a bit too green and peppery for me? Philosykos grew on me so much, the first time I smelled it, I didn't know what to think as it wasn't like anything I'd ever experienced. But over time, I've learned to really appreciate and enjoy it. I love Angel by Theirry Mugler.. I'm always iffy about it when I first spray it on but then throughout the day I love the smell. I've never smelt any of the ones you have here!